Discover the similarities and the differences that bind us and separate us. in common and those we don’t, and will be entered in drawings for small prizes during the program. Our May 12 vigil will be dedicated to the 70th anniversary of the Nakba, or catastrophe, of the 1948 removal of Palestinians from their native villages and lands. Click here to learn more about the campaign, including local western MA area organizing. – Poor People’s Campaign Gears Up for Mother’s Day Launch, by Sarah Anderson at Inequality. 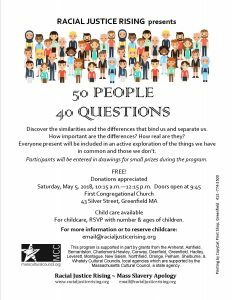 Saturday May 6, Greenfield MA: All Souls Unitarian Church’s annual Antiracism Film Festival. Racial Justice Rising is happy to collaborate with All Souls Church on this year’s film festival. We’ll have an info table there and more. Come say hi! 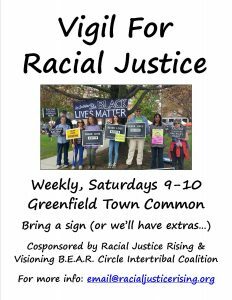 Thursday, May 24, Springfield MA: The Blood Is On The Doorstep Racial Justice Rising is pleased to co-sponsor this important film. – This App Can Tell You The Indigenous History of the Land You Live On, by Chelsea Luger at Yes!